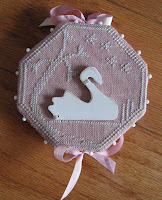 Last night I finally finished up the Ackworth Swan Treasure Keep from the February issue of The Gift of Stitching. It turned out absolutely lovely, and I think it ranks up there in the top 5 of my favourite pieces that I have finished, even though it isn’t my normal style. I’ve also finished up the first sleeve for Baby Man’s jacket. It was just able to get it out of the first ball of yarn. Below you can see the sleeve and ball #2 waiting to be used for the second sleeve and back. So, what’s next for me? Well, finishing up the jacket, even though it is going to be way to big for Baby Man to wear in the spring. I’m also going to get the second of those blue/purple socks started. 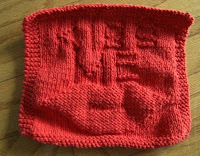 It is wise to always have a sock on the needles, I think. For cross stitch, I need to finish up Part 1 of Castles in the Air, and then I think I will work on the Jeanette Douglas tree design (the name of which I forget) and probably Camelot Miniature from Teresa Wentzler. And, of course, get Baby Man’s stocking started. 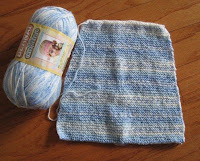 This entry was posted in Cross Stitch, Knitting and tagged Cross Stitch, Finishes, Knitting. Bookmark the permalink.